On January 1, 1863, Abraham Lincoln made history by signing the Emancipation Proclamation, declaring all Confederate-area slaves to be free men and women. This past New Year’s Day, we celebrated the 150th anniversary of the signing of this historic document. The National Endowment for the Humanities joined the celebrations in many ways, one of which is the Created Equal: America’s Civil Rights initiative. The Created Equal initiative combines four films produced by grants from the NEH and released within the past two years. The films explore different facets of freedom and equality in America. NEH hopes that they will promote conversations about the changing meanings of these concepts in American history. The films—in addition to other materials—will be distributed to 500 schools, libraries, museums, and community centers in the next three years. Interestingly, one of the films, The Abolitionists, takes us back even further in time in the struggle for emancipation. Thirty years before Lincoln would make history and change the landscape of slavery, a small group of reformers called for the immediate emancipation of millions of slaves. The reformers challenged Americans to confront the fact that a nation founded on freedom and equality was keeping millions enslaved based on the color of their skin. The Abolitionists documents this ambitious social movement. 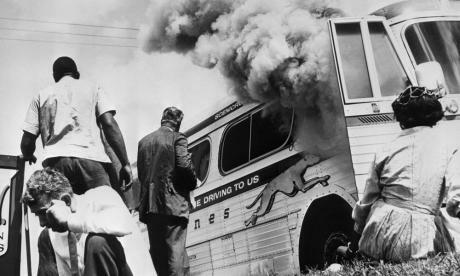 The other films include Slavery by Another Name, which documents the forced labor to which many African Americans were subjected even after the Emancipation Proclamation was signed; Freedom Riders, which explores American democracy, nonviolence, social change, and the dynamics of the Civil Rights movement amidst the 1961 Freedom Rides; and The Loving Story, which documents the interracial marriage of Richard and Mildred Loving that eventually led to the overturn of anti-miscegenation laws in the United States. Freedom Riders. Courtesy of Corbis. The four films are the kick-off for the Created Equal initiative. In addition to the films, Created Equal will also provide recipients with community toolkits, the traveling exhibition Changing America, online resources for middle and high school classrooms, an interactive website, and other resources. Screenings of The Abolitionists and Freedom Riders are available on OVEE, which allows you to watch the film with an audience, but in the comfort of your own home. Sections of the two films will appear in the Virginia Foundation for the Humanities first online screening on Feb. 28 at 4:00 PM EST, in which various human rights struggles will be addressed. In addition, The Abolitionists, Slavery by Another Name, and The Freedom Riders are all available for free viewing online at PBS.org; The Loving Story is available for viewing on HBO.com. The Created Equal film set was created in partnership with the Gilder Lehrman Institute of American History. Created Equal is funded by the NEH Division of Public Programs. Community organizations interested in receiving Created Equal will be able to apply for the film set beginning in March. Application guidelines will most likely be made available in mid-March. Film distribution will begin in late August 2013, and the program is expected to continue for three years. In selecting recipients NEH will consider the public humanities programs that the community organizations plan around the films, in addition to the organizations’ ability to reach target audiences and market programs effectively. Until the Created Equal website launches in late March, please address all questions to the Division of Public Programs. This entry was posted in Uncategorized and tagged Black History Month, Civil Rights, Created Equal, documentaries, education, Emancipation Proclamation, Freedom Riders, HBO, history, humanities, National Endowment for the Humanities, NEH, NEH Office of Congressional Affairs, OVEE, PBS, Slavery by Another Name, The Abolitionists, The Loving Story by nehblog1. Bookmark the permalink.